In this week’s post, learn how to market aftercare, makeup, and skincare,using social media to create additional revenues alongside your lash services. We’ve compiled easy tips and visual examples so you can get started right away. When you use social media to market aftercare, makeup, and skincare, you’re able to quickly and effectively inform existing clients and potential clients about what you sell, why they need it, and how to use it. 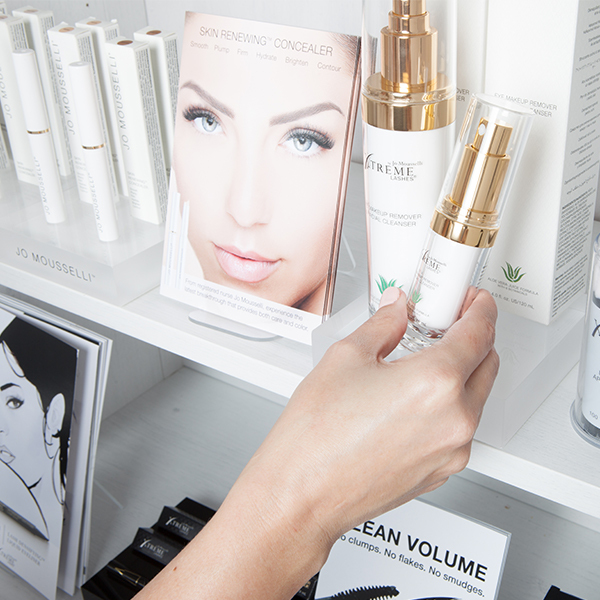 Your goal is to ensure that clients know about your retail offerings even before they arrive at your Lash Studio. This can help make selling retail much easier once the lash application is over and clients are in a hurry to leave. Although it might seem efficient to copy and paste official product descriptions into your captions, realize that social media is about creating a personal connection and this is where many beauty businesses fall short. Talk to your audience on an authentic level, suggest tips and tricks on how they can best use their products beyond what is said in the product description, offer useful advice to connect with the reader- in short, act like a good friend. Showing your personality in your social media dialog can help build rapport and trust. These 2 elements are key for converting your followers and viewers into shoppers. There’s a lot of competition online, but when it comes lash compatible cosmetics that does not sacrifice performance, you already have a strong contender. One key way you can set yourself apart from the rest is to show your followers that Xtreme Lashes cosmetics deliver something that others cannot: it’s eyelash extension compatible and great for non-lash wearers alike. Add this tidbit frequently into your retail posts to ensure to ensure that it sticks in your reader’s minds. In addition personable engagement, real user reviews and product demos offer tremendous value. For example, above is short-yet-effective demonstration showing how easy it is to remove our long-lasting Lash Densifying Liquid Eyeliner using the Xtreme Lashes Eye Makeup Remover & Facial Cleanser. When you start to market aftercare, makeup, and skincare on social media, remember that you still need to cross the finish line and make the sale. Social media exclusive offers, sales, contests, and giveaways can all add perceived value to your Lash Studio and retail business within it. For example, try running a “Location Check In” promotion: Check in to my Lash Studio on Facebook and receive 10% off your Lash Service or a complimentary Eye Makeup Remover & Facial Cleanser Mini ($15 value) when you spend $75 or more. Not only do these incentives give thanks to existing customers and followers, they encourage your fans to continue following your social updates, recommend your business and products to friends, and (most importantly) make a purchase again. When running a promotion, do make sure to keep the Minimum Advertised Pricing for Xtreme Lashes products in mind. Instagram – For looks and application tips. YouTube – For interviews and tutorials. Facebook – For blog post updates and business tips. Twitter – For news and updates. Pinterest – For beauty inspiration.